Recently my cousin, Pat asked me to create a card for her granddaughter Kaley. Pat told me Kaley likes horses and the color green. She also stated that Kaley was turning 17. So, as I pondered what I would create for Kaley's 17th birthday card, the wheels began to turn. I knew I wanted to wow both Pat and Kaley. So I immediately decided to stamp a scene. So I pulled out my mountain scene stamp from Stampscapes and stamped onto glossy cardstock (photo paper) with Memento Black. Then I added some trees from Stampscapes and Stampin' Up! The Mare and colt from Stampabilities was stamped onto a separate piece of glossy cardstock then cut out. Using the Top Note Die from Stampin' Up! I created a window. I colored the images with my Stampin' Up! markers and a dauber. Added highlights with a white gel pen. The dotted Ranger Liquid Pearls to make the flowers. The sentiment is from Stampin' Up! The flowers are Petaloo. 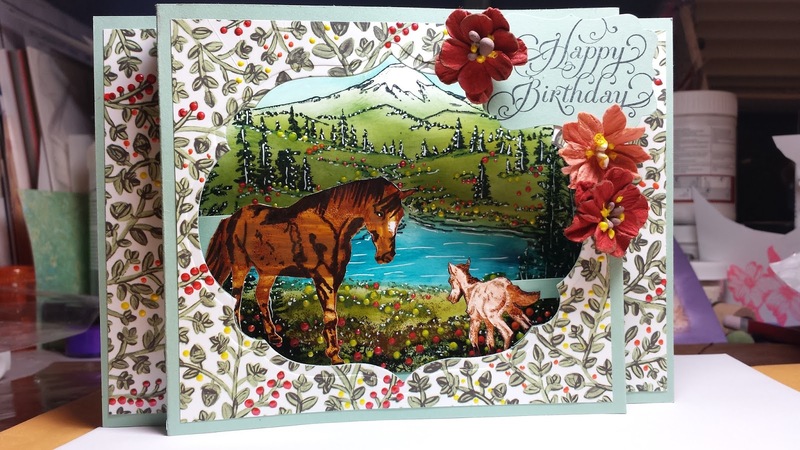 The card is interactive in that when you pull and push the side tabs the mare and the colt come together and the mare kisses the colts head. This card was great fun creating. A labor of love.